Twenty years ago in Harper’s Ferry, young Malachi Taylor went missing and he was followed by another 13 people who disappeared over a two month period. It was always suspected that the hermit Eugene Dutton was to blame, but nothing was ever proven. Now, decades later, people have started to vanish again, and it’s up to you to investigate Eugene’s house and figure out what’s been going on before you too go missing! As a unabashed fan of horror themed escape rooms, I was excited to hear that Masterpiece Escapes was building their own take on the ubiquitous serial killer theme. Having experienced their other rooms, full of well designed secrets and twists, I knew that this one would be special! After walking inside, I was sure that I wasn’t wrong on that point! Masterpiece Escapes continues to surprise our veteran group with even more cleverly hidden secrets, original puzzles and a room that turns some of the usual serial killer escape room tropes on their head. The introduction to the room was again delivered in an exciting way by a live actor, and set up the mystery in an interactive way. Meticulously decorated set design helps drive the tense narrative towards the big reveal and beyond! Puzzles were intuitive without being simple, and were integrated into the theme well. Also, the hand-crafted nature of Masterpiece’s puzzles lent this room a more authentic feel, tying together the 70s inspired house and decor in a convincing way. Technology is peppered throughout the room to give the experience a spooky feel, and mounting horror it instills adds to the thrill of this adventure! One of the focal points of the late game is initially overwhelming, but proves to be manageable. However, it still requires a fair amount of guess and check due to several repeat types of lock entry. After a large and exciting buildup, the climax doesn’t quite deliver a big payoff, but the room as a whole doesn’t suffer from this. With Missing, Masterpiece Escapes takes a common escape room theme and weaves it into a unique and exciting adventure! I always go into their rooms expecting to be amazed, and this room is no exception. I highly recommend escape room fans and lovers of all things spooky to give this one a shot! You can book your investigation into the old Sutton house here! Full Disclosure: Masterpiece Escapes provided media discounted tickets for our team. Your crack team of thieves has found a weakness in the security of the Queen City Bank, one of the most secure banks in the United States. Housed inside is an enormous diamond, worth millions! If you can get your hands on it without getting caught, you’ll be set for life, but your infiltration will only buy you an hour, so get in and get out with the prize before the cops put you away for life! 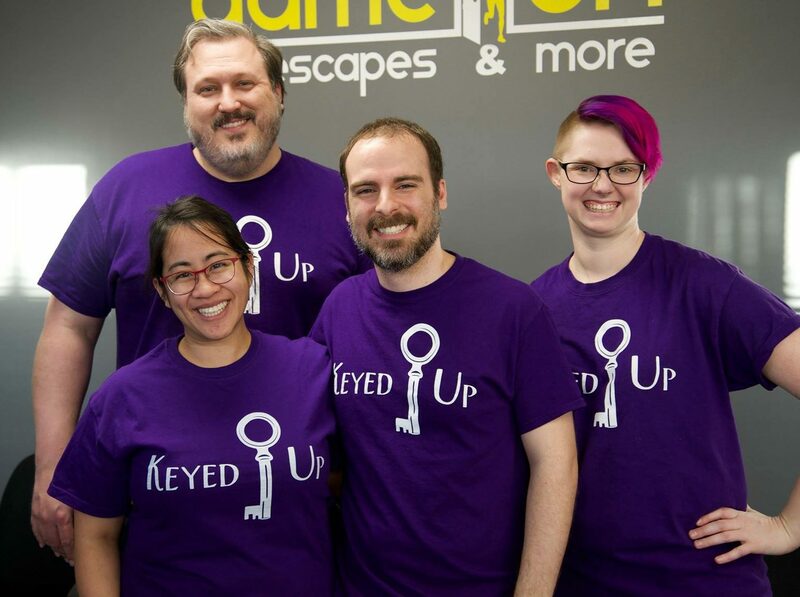 Our team was the group posing as janitors in order to gain entry to the bank, and once we were ushered into the room, I was actually fairly underwhelmed for the first time in an Exit Strategy room. The opener was very sparse, but as I’ve enjoyed most of their other rooms, I was willing to give it a shot! Puzzles, for the most part, made good sense and flowed well into each other in a puzzle room type sense. There were a few surprises that kept us on our toes, and a usual standby was implemented in a fun way that encouraged teamwork. This was one of the larger rooms at Exit Strategy, and it felt like the recommended players for the room was reasonable. The climax was a great capstone to the room and kept our hearts pumping while we captured our treasure and booked it out of there! Some weird points during the game felt very off theme. Random blood splatters and references to vampires felt very out of left field and made little sense, story-wise. The splitting of the teams had the same issue as most split team games, namely that one room had way more to do than the other, and the communication method between teams felt unnecessarily awkward. A few points of the early game were a slog because we had to wait for the other team to work through or find something while we were generally spinning our wheels waiting for something to do. One bummer was that we also had a downer GM for this game, which is very out of the ordinary for Exit Strategy. After 10 previous games at this company with great customer service, regardless of our opinions on the room, this was quite the shock. The set design of the room was also very strange, as it didn’t feel as much like a proper bank, however this is an older room, and Exit Strategy has made great strides in that department. Another of Exit Strategy’s older rooms, it hasn’t aged poorly, but it definitely shows in comparison to their newer rooms. It’s a reasonably challenging and fun room, however, but I definitely recommend doing it before any newer offerings, as it definitely comes from a different generation of escape rooms. Gather your team and plan your heist here! Your team of astronauts is testing out one of the older ships when suddenly, mid-flight, your orbit starts to decay fairly rapidly due to a systems malfunction! The intern runs off with the only escape pod, so it’s up to you to fix it as soon as possible before the ship, (and you! ), burn up upon reentry! We were looking forward to our time in Lost in Space after a fun, if slightly flawed, romp through Gone. The experiences we’ve had at Exit Strategy have been mostly positive, and this was one of the last two games we needed to play in order to finish up the 10 (10!) rooms they currently have on offer. A lot of hands on puzzling and scavenging made for a very interactive an immersive game for most of us, (more on why I say most of us below,) and the set, while simpler, had the feel of a mechanical rocket ship down pat. One puzzle involved a certain technical part of the ship that looked and reacted interestingly throughout it’s solving, and was a lot of fun for two of us to work through. The way we activated the latter part of the game was enjoyable and felt appropriate for the theme, and most puzzles tied in well to the “fixing a broken spaceship” concept. The problem with this room was that an 8 person maximum was way too much for the game. Whereas I and others had a good bit of fun, a few players didn’t really get to do much because there just wasn’t enough for our group of 7 to engage with! Had it just been our group of 5, it still would’ve been a little crowded, which stinks, because the game itself was a fairly good time for those of us that got to play. One of the main set pieces looked like a set up for a fun climactic puzzle, but ended up being just for show, which was a huge let down. The actual climax wasn’t all that interesting, and at the point the game ended, we were all saying, “oh, it’s done? That’s it?” One puzzle was non-responsive and needed a more than usual amount of pressure to get it to work, as well as being fairly obtuse in it’s solving. Lost in Space is one of Exit Strategy’s older games, so we can definitely see where they have improved majorly since the early days, but it is still a fun game, with a caveat. Very rarely would I say it’s crucial to book the room privately and go with a small group if possible, but for this room, it is an absolute must in order for everyone to have fun. It’s definitely a hard room to recommend otherwise, however, since our group had such wildly disparate experiences due to the linear nature of the room. You can book your trip to space here! Taking an Uber to a Haunted House is a very, very bad idea. Back on Christmas Eve of 1986, Abigail Harper went missing, along with her entire family. Ever since then, her home has sat abandoned due to the rumors of a haunting inside. Could Abigail’s spirit still be lingering inside, waiting to be released, or perhaps she’s up to something more sinister? Break into the dilapidated old home and perhaps you’ll have the misfortune of finding out where everyone has Gone. Our favorite room of all time, The Final Sacrifice, was retired in September of last year, but when we heard what was coming to take it’s place, we were instantly excited! Gone. promised a spooky haunted house with all the theatricality of it’s predecessor, and we were so on board for that! We were greeted by our Uber driver, Hannah, who promised to take us to the old house on the condition she didn’t have to go in with us, and were set loose on the room! A special shout out to Hannah, our Uber driver, who was an excellent GM and host! Set design was really great, starting us off with a startling and unique puzzle and leading into a realistically sized haunted house. The first 75% of the game was extremely exciting and went from spot to spot excellently. Gameflow worked very well, and was full of spooky surprises and scares! Sound effects helped lead us along though the many different rooms excellently, and added to the immersion. The atmosphere and well hidden and utilized technology really created the sense of dread promised by the theme. The latter quarter of the game really fell apart hard. The final puzzle was a bit of a mess, and while the rest of the game felt really on theme, this one was out of left field. Unfortunately, this also led to an anticlimactic ending, leaving a couple of mysteries unexplored, wasting a good bit of potential we were hoping for. The house was decked out for Christmas Eve as well as being themed to the 80s, but this didn’t really add anything, I would’ve liked to have seen this tied into the theme and game more, but alas, it just felt out of place. One spooky effect was cut short after the prop came to an unfortunate stop on my shins. After a strong start, Gone. petered out by the end, which was a let down after such amazing buildup. There’s definitely a lot of potential here, and even with the present issues, I think it’s worth a look for the set design and great first 3/4ths of the game. With some adjustment to the finale, I think this could be the scariest and most enjoyable adventure yet. Book your time investigating the haunting here! A developer is getting ready to knock down an old west saloon in order to build some high rises, but they’ve found a vault inside that they haven’t been able to get open. Rumors abound about what could be inside, but the most prevalent of them is that it is full of gold due to the original owner’s status as a prospector! Your team has been called on to crack the safe, but the developer is getting tired of waiting around, so get it done within the hour, or they’re going to blow the saloon and the vault to smithereens! Masterpiece does a great job with their sets, building really immersive, high-quality rooms that draw you into the adventure, and The Deadwood Saloon is no exception. Small touches here and there really sell the saloon, as well as entertain you with humorous and subtle jokes. As always with their rooms, we were excited as we stepped in and were ready to puzzle, even though it was our 5th room on the day! Along with the amazing set, there were fun connections to Masterpiece’s other rooms, which was fun as veteran players of their rooms! Props were all very high quality, and were excellent fun to play with. The inclusion of an optional puzzle that provides a fun treat is present here, as in all Masterpiece’s rooms, and is just as rewarding the fourth time as it was the first. Puzzle flow is great, and a non-linear approach allows players to jump between puzzle types and find what they enjoy solving. Our entire team of five were fully engaged throughout this, Masterpiece’s most challenging, but in no way unfair, room. Masterpiece really knows how to surprise veteran players as well, subverting our expectations and opening up new spots without our having the slightest idea that it was going to happen. The climax to the room was excellent and provided a great payoff! Also, special thanks to Uriah and his team for helping us say farewell to our teammate Cathy by hiding a special escape gift in the room for us! We will miss you Cathy! Some puzzles were a little sticky, taking a bit more finagling than usual and making the solving more frustrating at times. A puzzle nearer to the end was a bit difficult to make out at times and felt a little out of place due to it’s interior location. The Deadwood Saloon is another great effort from the folks at Masterpiece Escapes, continuing their tradition of extremely creative puzzles and rooms! They’ve once again blown our minds with their cleverly hidden surprises and I recommend anyone near Indian Trail look them up! You can book your time in The Deadwood Saloon here!